My kids know I have superpowers. I have superpowers on the hockey field and superpowers making curry. When they were little they thought I had super- super powers, then they grew up. Childhood is a magical time when even the stuff of the day-to-day is exciting and the ordinary often seems extraordinary. A part of this magic is that with just a little imagination, we all might be found to possess true superpowers!This isn't the first or last book where a child delightedly discovers her own superpowers. But it may be just about the driest, funniest, and sweetest, where the discovery is handled with humor and charm. 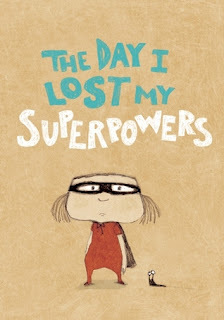 One of the book's true pleasures is that it's a girl who discovers her own extraordinary abilities, and when her powers fail, as they must, she discovers them in her mum.